The comedian delivers a decidedly unadventurous set, but manages to fashion unpromising raw material into killer lines and vivid comic images. 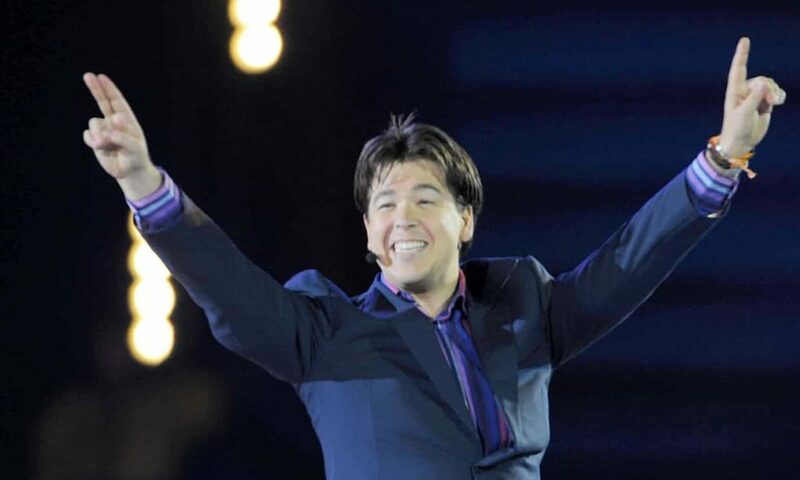 If there were any doubts that Michael McIntyre is the presiding monarch of British standup, he’s doing his best to dispel them with this new touring show, significantly entitled Happy and Glorious. He’s reigning over us for seven nights at the 20,000-capacity O2 Arena, and begins the show with a montage of clips of his subjects – sorry, members of the public – performing their own versions of well-loved McIntyre gags. The message is clear before he even steps on stage: long live our noble Michael, popular comedian supreme, his every gag gladdening the hearts of the nation. There are plenty more routines in this show that fans will enjoy performing among themselves long after McIntyre’s motorcade has left town. One or two seem precisely designed for that purpose, like the skit about British holidaymakers pussyfooting around the swimming pool, which exists mainly to celebrate that well-worn poolside platitude – and readymade catchphrase – “it’s alright once you’re in”. 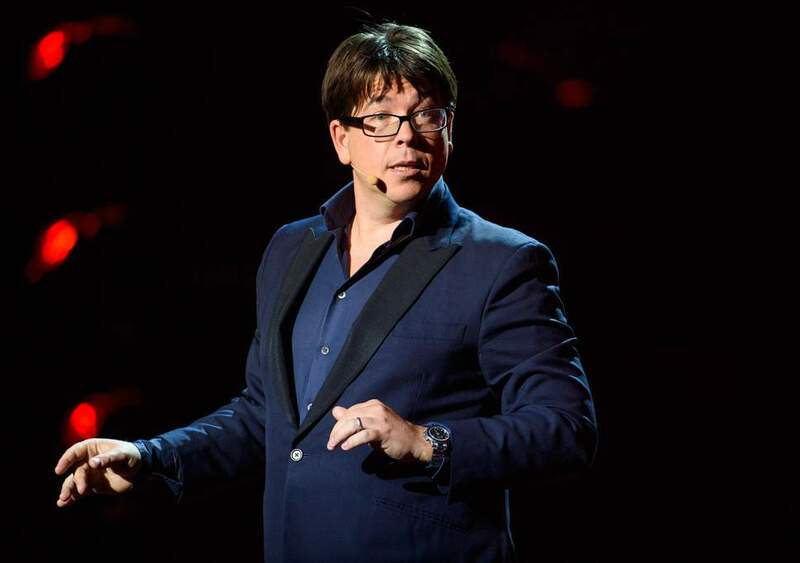 It may be as daft to expect new tricks from McIntyre as from the Queen herself, but even by his standards, this is an unadventurous set, featuring routines about service stations, snoring spouses and – not for the first time – funny walking. There’s a section on airports too, among the hoariest of standup subjects. McIntyre begins by inviting us to recognise the unacknowledged race with other passengers we all engage in – don’t we? – from our seats on the plane to baggage reclaim. Not for the first time, when faced with coercive observational comedy, I found myself excluded from the consensus – as, indeed, when McIntyre joked that all British people react in exactly the same way to queue management systems at passport control. Cue McIntyre wheeling out a knackered national stereotype to trudge up and down roped-off rows while flamboyant Brazilians and efficient Germans take the short cut. And yet, it’s hard to get too republican about the show, because – just when you’re despairing at the imaginative paucity of McIntyre’s shtick – he fashions his unpromising raw material into a killer line or vivid comic image. A routine about desperate parenting ends with the comic’s wife wearing Calpol syringes in a holster, firing sedative unguent into other people’s kids. “You’ll thank me for that. Call me in 4-6 hours.” The McIntyre family’s relocation to Wiltshire inspires a fine set-piece about the terrifying blackness of rural night, as unidentified animals cackle, sob and bark out of the dark. Elsewhere, our host acts out this or that quotidian activity, and nails the detail to render it blithely funny – as when finding himself with company in a revolving door. (“Why is there a stranger in my segment?”) It ends with another cliche, as McIntyre imagines frightening burglars from his country pile by feigning a Scottish (by which he means aggressive, “see you Jimmy” Glaswegian) accent. Overall, it’s a more sedate set than he’s supplied in the past. There’s less skipping around – and even then, he sometimes seems breathless. There’s a section on the aches and sudden physical frailties of middle age. But McIntyre’s comic powers are, on tonight’s evidence, in fairly rude health. If God doesn’t save him, his homing instinct for middle England’s funny bone – unerring as ever here – probably will. Original article posted on The Guardian.